In the middle ages there were a dozen or so farms each with their own farmhouse scattered right across the parish. Itchingfield never had its own manor house so there was no resident Lord to rule the population. Everyone who lived in the parish either had a smallholding of their own or was a tenant of one of the landowners. Barns Green village grew in importance in the 19th century when the Chitty family made Muntham House their principal home. They farmed the land and employed a number of labourers, building cottages for them to live in. The first part of the railway line, running north to south through the parish was built in the 1850's bringing a band of labourers and leaving a number of railway employees in its wake (signalmen, gate keepers and maintenance workers). The east/west railway line was built in the 1860's and a junction and goods yard created just inside the parish boundary near Westons Farm. A railway halt at the same location enabled passengers to change from one railway line to the other. The Muntham Estate was purchased by Percy Godman in the 1870's and he completely rebuilt the old house and lived the life of a Victorian country gentleman. His large retinue of servants and employees all needed to live somewhere and so more cottages were built around Barns Green. 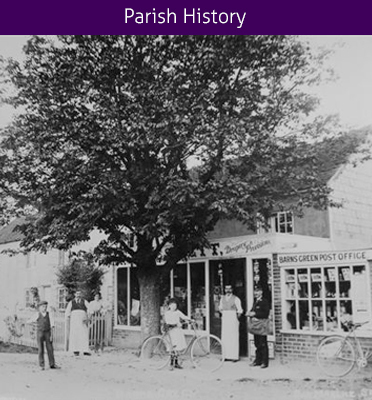 Late in the 19th century a Post Office was established in Barns Green to serve the growing population and at about the same time, a family of local builders settled in Barns Green. Allen Parker had a large family, and as they grew up he built them houses around Barns Green (about 10 in all). In the 1930's a local entrepreneur developed several areas of housing, notably Trout Lane and some of the developments on Bashurst Hill. During World War II many of the large houses around Horsham, including Muntham in Barns Green, Marlands in Itchingfield and Wellcross on the northern edge of the parish, were commandeered and used by the Canadian Army. After the war these estates were broken up and sold, Muntham House becoming a boarding school for boys and Marlands and Wellcross nursing homes for the elderly. Many of the estate cottages and houses passed into individual private ownership for the first time. In the late 1940's, Barns Green was chosen as a good site for housing for some of those dispossessed by the War. A large number of houses was built (The Hordens, Salt Box Close and Peskett Close) and the population almost doubled at a stroke. In the late 1960's, Barns Green Farm was sold and the land set aside for housing development. Several phases of construction saw the extension of the Hordens and the construction of houses in Smugglers Way and Finians Field. The dramatic increase in population, not only saved the school from closure but led to the construction of the Infant Department of Itchingfield School in Barns Green village. On Bashurst Hill and in Valewood Lane a number of small housing developments have also increased the local population in recent years. The only other significant housing development was the building of Ashmiles. This small estate located just by the railway line off Two Mile Ash Road has 69 properties the first of which was completed early in 2015 and is due for final completion later in 2016. It is estimated that the new estate will increase the population of the Parish to around 1650 people. A highly rated campsite with adjacent competition standard fishing lakes has recently been fully opened in the village of Barns Green. Both these facilities are on a former dairy farm, the farmer having diversified into leisure. The campsite brings many visitors to the parish who make use of the local pub and shop during their stay in Barns Green.